Skilled practices serve as an anchor to the world beyond one's head--a point of triangulation with objects and other people who have a reality of their own. There were places where Crawford made my head hurt. But that was because he was introducing thought leaders, concepts, and constructs that are not a part of my everyday musings. And while I think his evolutionary worldview causes him to miss the point on some issues of morality and the Protestant Reformation (is he a victim of a sort of "choice architecture" [page 117] himself? ), his cogent thinking and writing is insightful and full of implications for life in general and education in particular. 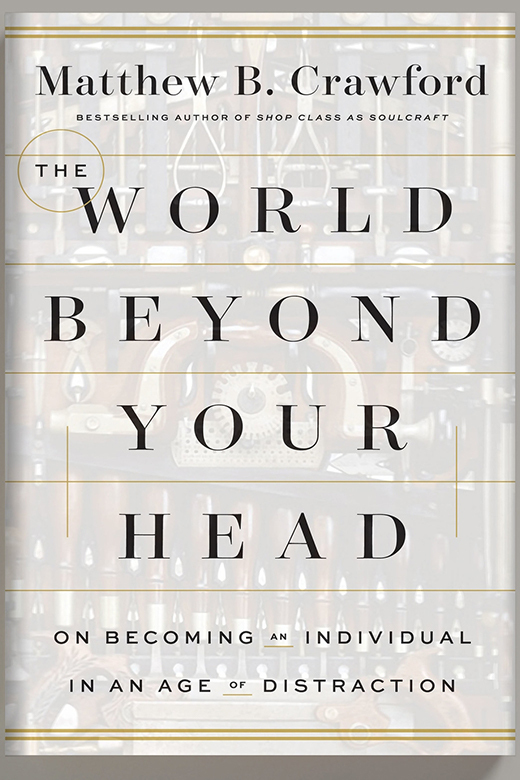 Crawford contends, and following his line of thought I agree, that we are cheered on to "think for ourselves," but often those choices are engineered for us by a world increasingly governed by big data. Don't worry, this is not a "Look out for Big Brother" kind of text. It is a whack on the side of the head to think about how you are thinking and what we must do become an individual in an age of distraction. 3. Freedom: "We have moved from an argument about the illegitimacy of particular political authorities in the seventeenth and eighteenth centuries, to the illegitimacy of the authority of other people in general, to the illegitimacy of the authority of our own experience." Chapter 5, "A Brief History of Freedom," page 122). Is our so-called freedom being manipulated by "the dark arts of attentional design"? (page 107). It sure looks that way. 4. Education: The dangers inherent in treating education as a business enterprise (see chapter 6, "On Being Led Out" particularly pages 138ff). Crawford gave me new appreciation for the role of the professor in the digital days of MOOCs. They are the mentors that help us connect ideas of the past with the information of the present. 5. Celebrating the craftsman: Crawford's focus on the artist, whether that be the short-order cook, organ maker, or skilled motorcyclist helps to reevaluate and reposition innovation; recognizing it's importance without bowing down to it as the be-all-end-all in business, education, and life. This book is worth your read -- and re-read!